Westminster’s Council Cabinet met on the 26th October and gave the go-ahead to the Cabinet Report recommendations- to develop what is termed a, “Place Strategy,” for the whole of the Oxford Street area. This strategy promotes a set of fifteen, “overarching place based principles”, to be presented to stakeholders and residents as part of a public consultation process between 6th November and 16th December. Priority will be given to pedestrian space with the aim of widening footways and narrowing the existing roadway. Existing public spaces and squares in the area will be improved. There will be an increased and much-needed emphasis on street management, street cleaning and waste management. These proposals are to go to the full Council for approval in November and any responses or feedback that the Council receives through consultation responses may lead to further changes in the Strategy and, or the Delivery Plan. A new website has been launched at https://osd.london which provides details of the proposals for the Oxford Street District. It will also provide updates and details of the consultation and how to subscribe to the regular newsletter. 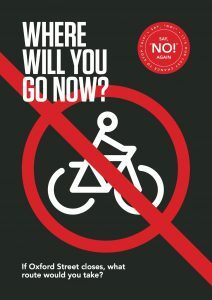 The proposals have been informed, not only by the responses from the initial joint TfL/WCC consultation but from a series of engagement meetings with over fifty stakeholders including residents held between July and September. It is clear that the Council has listened and acted on what these groups have said. They will look at ways of reusing surplus retail space and redeveloping it to suit the needs of an evolving economy. The importance is now clearly understood of protecting the neighbourhoods around Oxford Street: Fitzrovia, Marylebone, Mayfair and Soho. The majority of the proposals appear well thought out and sensible, embracing and complementing these neighbourhoods, not subordinating them, as previously, to the perceived benefit of one street. Of course, all this comes at a price – £2.5 million for the development of the proposals and a projected £150 million for the whole scheme. This is a very significant sum, showing a serious commitment to the area. Indeed, it is on a par with the total expenditure that TfL and the Mayor were previously contemplating for their scheme. It is anticipated that this level of funding will require substantial contributions from external sources in addition to Westminster’s capital budget. However, in the papers we have seen, these sources have not as yet been formally identified. In summary, we now have a pragmatic and evolving scheme which offers a holistic approach across the district, one which acknowledges local priorities from Marble Arch through Oxford Circus to Tottenham Court Road. It addresses key issues notably lacking in the previous proposals: district-wide improvements, enhancement of the neighbouring areas and an emphasis on access to and from Oxford Street. There are still concerns over future accessibility arising from the extensive proposed cuts to the buses and bus routes running to and through Oxford Street. 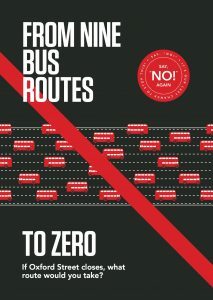 This, however, remains in the hands of TfL and as such is not part of the consultation. There is still also the concern that the Mayor, and certain elements in the Greater London Authority, will pursue the pedestrianisation agenda by some other means- such as attempting to take over control of Oxford Street. To do this would ignore the democratic mandate obtained from the council elections, and the popular endorsement subsequently confirmed from the extensive consultation. This would be a retrograde step and most inadvisable. We are, though, in a far better place than we could have hoped for this time last year at the opening of the first Oxford Street Consultation. Then, on the roof garden at John Lewis, the Mayor addressed us all on a project to pedestrianise Oxford Street and he clearly saw the consultation as merely a formality prior to its endorsement. That scheme was however unworthy of the district it claimed to serve, a message that the residents sent out loud and clear to the Council by various means, both prior to, and during the elections. The Council listened and as a result, it has now been unceremoniously dumped. In its place, we have a series of sensible and pragmatic proposals which will benefit, not only Oxford Street but the whole West End area, its residents and the businesses within it. In this new scheme, Westminster Council has the support of all the West End amenity societies. In summary, we feel that the Council are now actively attending to the concerns of residents and businesses. They have stood up for them and scuppered a scheme which was not wanted by those who live and work in the West End. We have seen the congestion and displaced traffic that has resulted from various TfL schemes in other parts of London, in spite of their claims to the contrary beforehand. We have seen how, once TfL launch a consultation, the desired outcome is usually a foregone conclusion. This time, however, the outcome has been different. This time the consultation responses were heeded and the Council’s subsequent uncompromising stance against the Mayor’s unwanted scheme finally saw it off. The action taken in defence of the area and its residents by Westminster Council is to be applauded. It shows that it is possible to stand up to TfL, who are unelected and accountable to no one – save the Mayor. It is an example of democracy in action and as such sets a notable precedent. 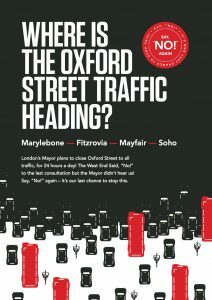 ‹ A scheme not just for Oxford Street but the whole Oxford Street District.